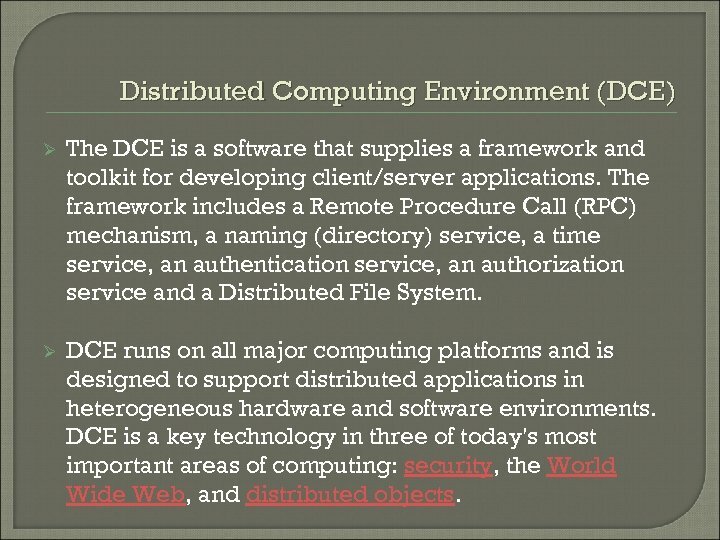 Distributed Computing Environment (DCE) Ø The DCE is a software that supplies a framework and toolkit for developing client/server applications. The framework includes a Remote Procedure Call (RPC) mechanism, a naming (directory) service, a time service, an authentication service, an authorization service and a Distributed File System. 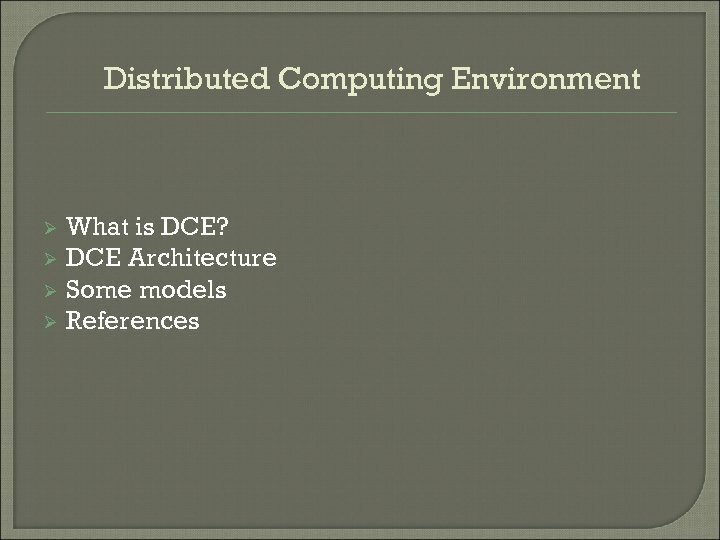 Ø DCE runs on all major computing platforms and is designed to support distributed applications in heterogeneous hardware and software environments. 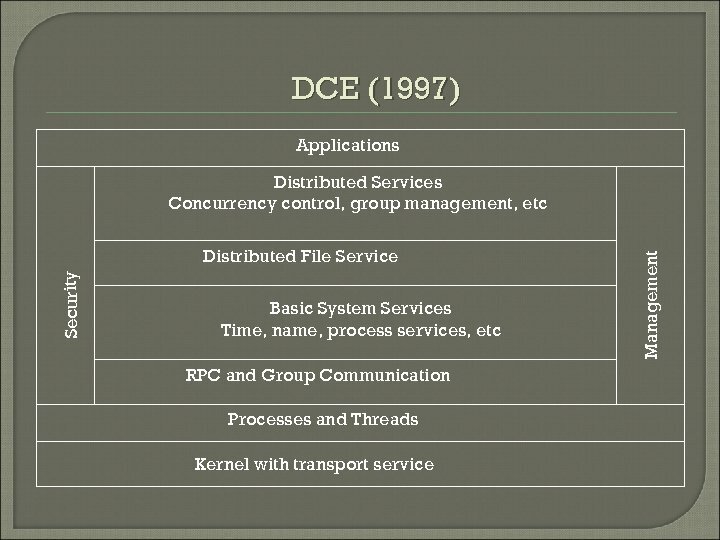 DCE is a key technology in three of today's most important areas of computing: security, the World Wide Web, and distributed objects. 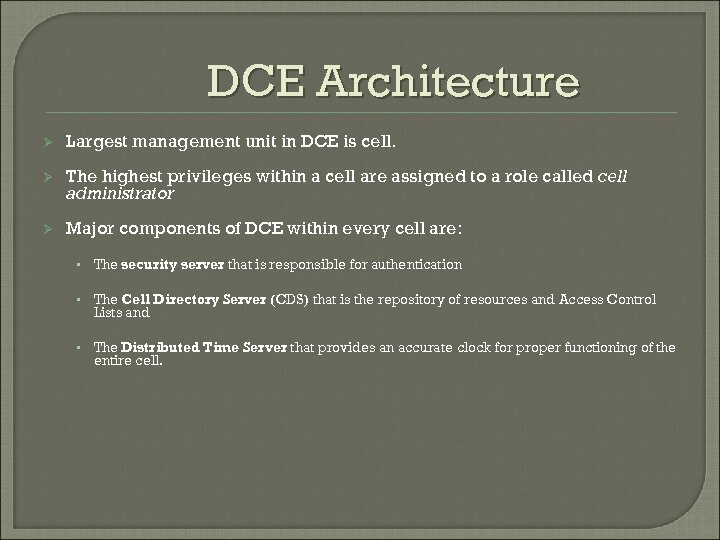 DCE Architecture Ø Largest management unit in DCE is cell. Ø The highest privileges within a cell are assigned to a role called cell administrator Ø Major components of DCE within every cell are: • The security server that is responsible for authentication • The Cell Directory Server (CDS) that is the repository of resources and Access Control Lists and • The Distributed Time Server that provides an accurate clock for proper functioning of the entire cell. 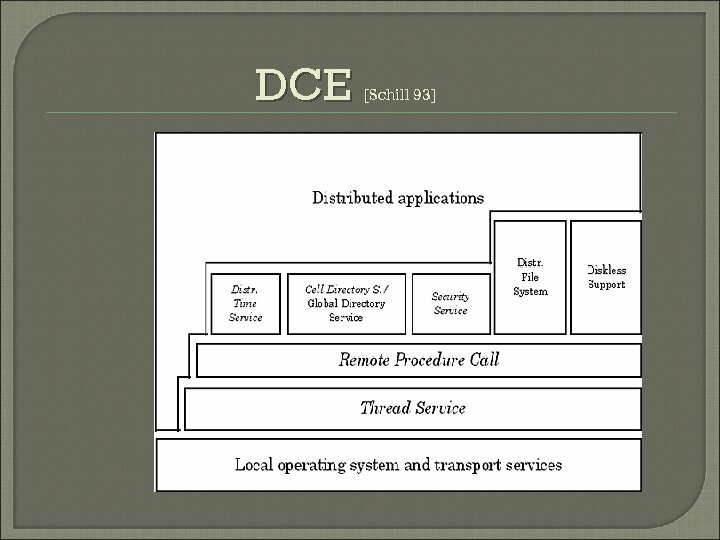 DCE [Schill ’ 93] The DCE infrastructure supports the construction and integration of client/server applications while attempting to hide the inherent complexity of the distributed processing from the user [Schill 93]. 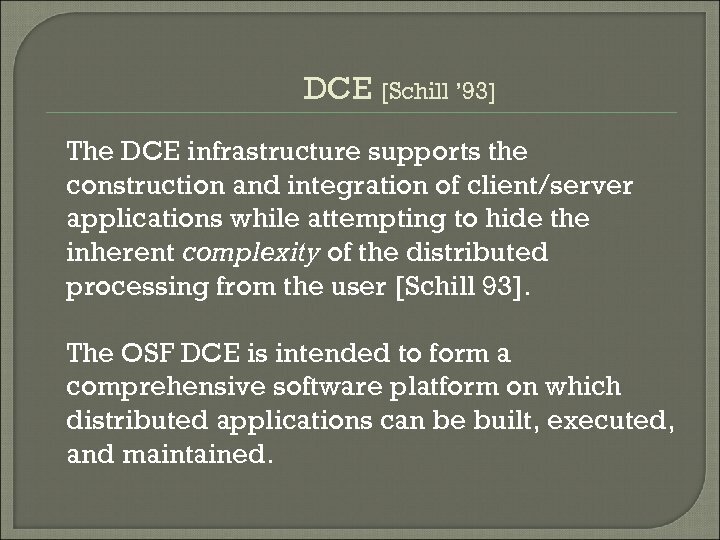 The OSF DCE is intended to form a comprehensive software platform on which distributed applications can be built, executed, and maintained. 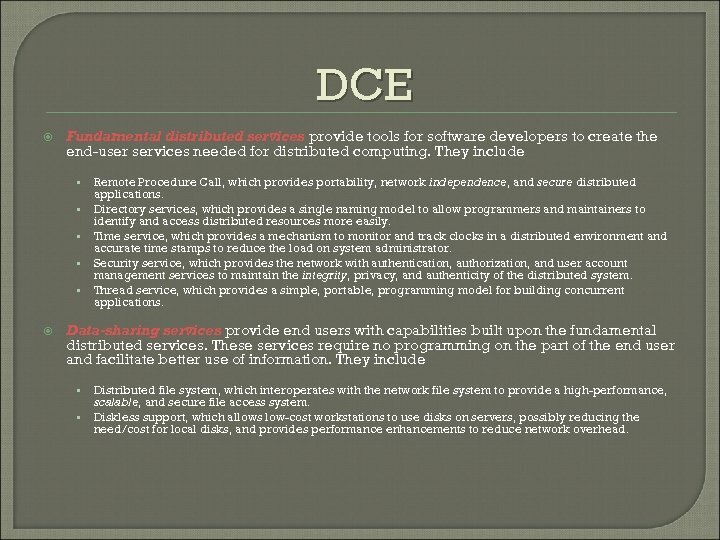 DCE Fundamental distributed services provide tools for software developers to create the end-user services needed for distributed computing. They include • • • Remote Procedure Call, which provides portability, network independence, and secure distributed applications. 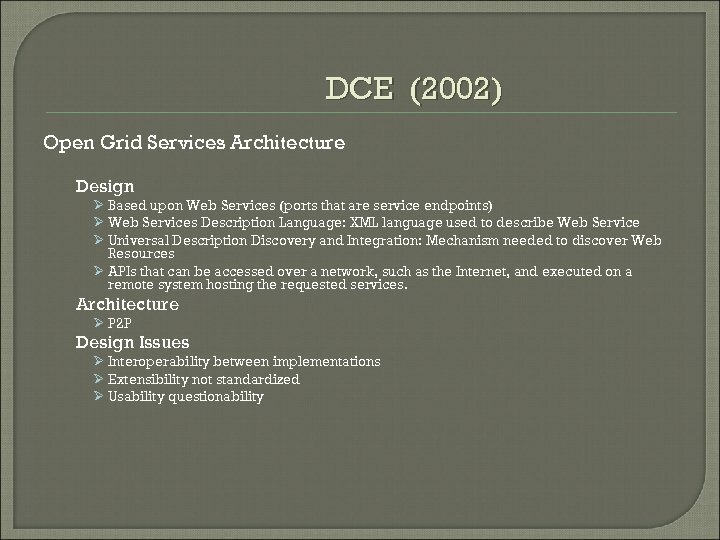 Directory services, which provides a single naming model to allow programmers and maintainers to identify and access distributed resources more easily. Time service, which provides a mechanism to monitor and track clocks in a distributed environment and accurate time stamps to reduce the load on system administrator. Security service, which provides the network with authentication, authorization, and user account management services to maintain the integrity, privacy, and authenticity of the distributed system. 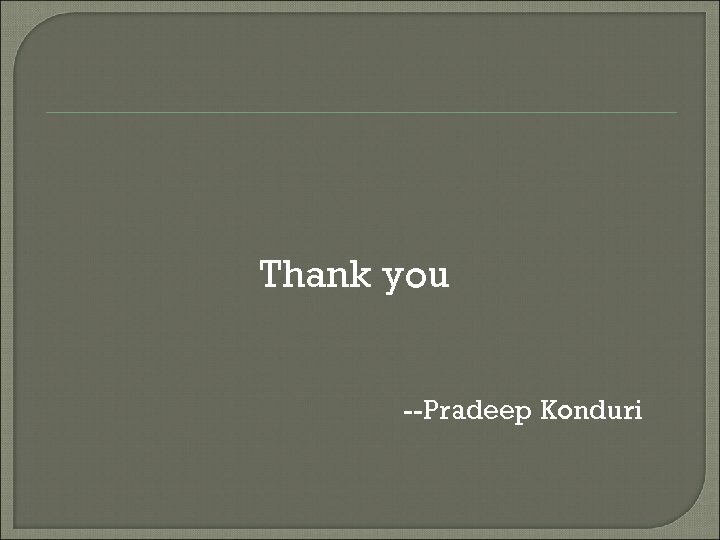 Thread service, which provides a simple, portable, programming model for building concurrent applications. 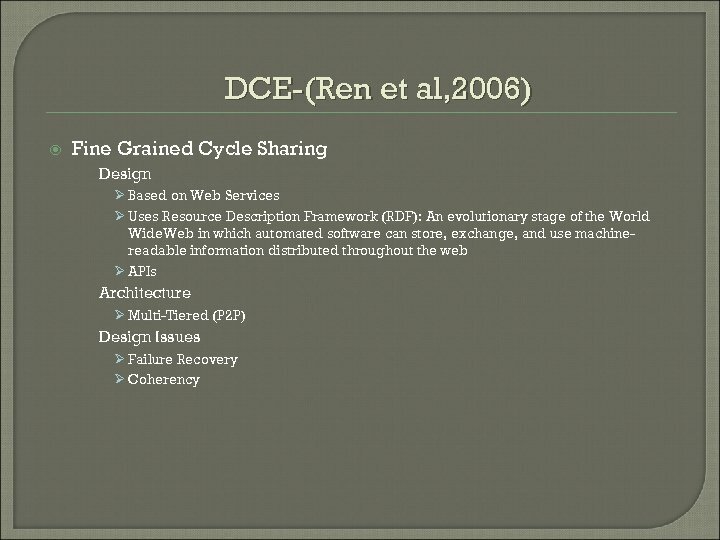 Data-sharing services provide end users with capabilities built upon the fundamental distributed services. These services require no programming on the part of the end user and facilitate better use of information. They include • • Distributed file system, which interoperates with the network file system to provide a high-performance, scalable, and secure file access system. Diskless support, which allows low-cost workstations to use disks on servers, possibly reducing the need/cost for local disks, and provides performance enhancements to reduce network overhead. 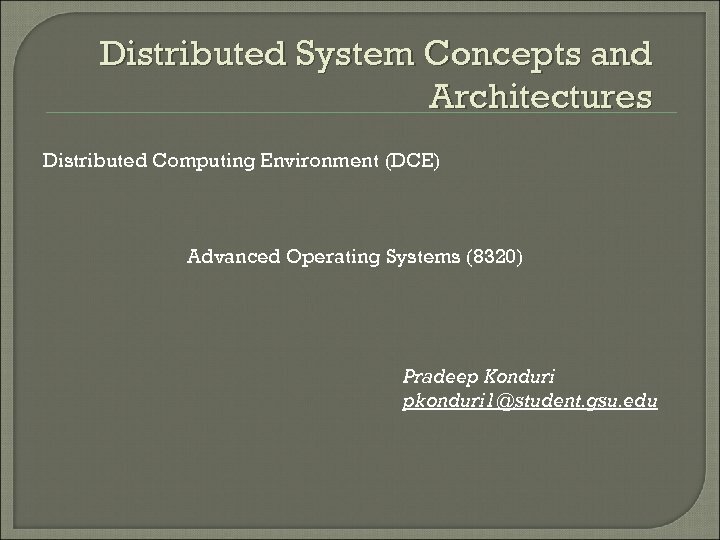 References: Distributed Operating Systems & Algorithms, Randy Chow and Theodore Johnson, Addison Wesley, 1997 Distributed Systems principles and paradigms by Andrew S. Tanenbaum, Maarten van Steen, 2002 http: //en. wikipedia. 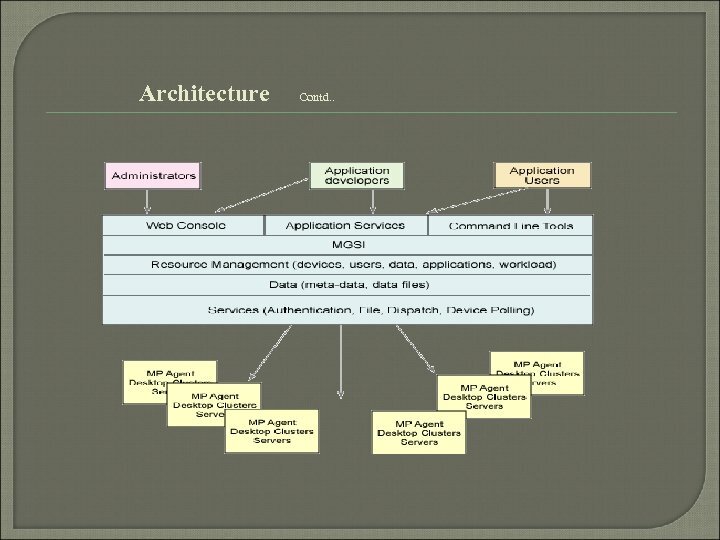 org/wiki/Distributed_Computing_Environment http: //www. sei. cmu. edu/str/descriptions/dce. 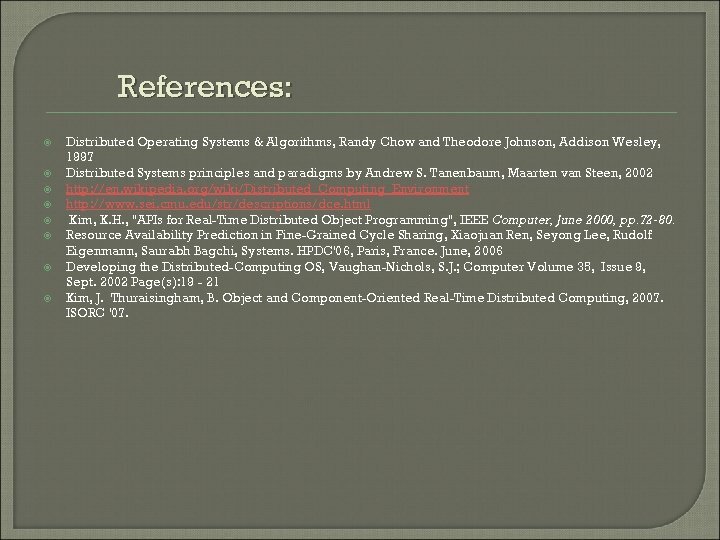 html Kim, K. H. , "APIs for Real-Time Distributed Object Programming", IEEE Computer, June 2000, pp. 72 -80. Resource Availability Prediction in Fine-Grained Cycle Sharing, Xiaojuan Ren, Seyong Lee, Rudolf Eigenmann, Saurabh Bagchi, Systems. HPDC'06, Paris, France. June, 2006 Developing the Distributed-Computing OS, Vaughan-Nichols, S. J. ; Computer Volume 35, Issue 9, Sept. 2002 Page(s): 19 - 21 Kim, J. Thuraisingham, B. 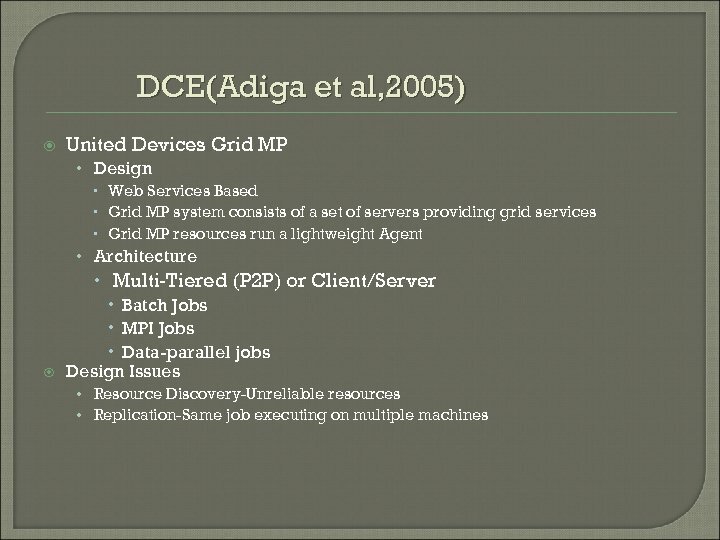 Object and Component-Oriented Real-Time Distributed Computing, 2007. ISORC '07.